Single or in a relationship, dudes should be careful about giving mixed signals to the ladies. 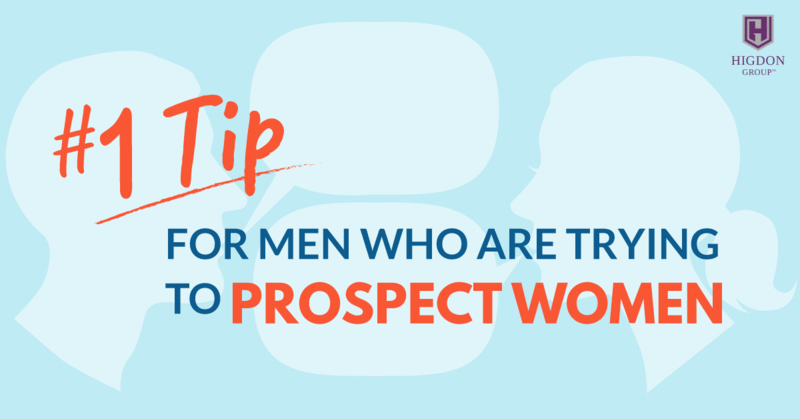 Here’s my best advice for any men that are prospecting women for their network marketing business. If you’re not single, number one tip here. You ready for this? This is the number one tip, and I gotta give credit where credit’s due. I learned this from one of our Top Earner Mastermind clients and good friends Angel Fletcher. So, Angel Fletcher, I think she’s crushing out like half a million a month just absolutely killing it. If you’re prospecting the ladies then you need to have your wifey all over your profile. All over it. The reason is, it will reduce the resistance. But if they look at your profile and it’s you and your happy wife, and they look and there’s family pictures of you and the kids, and you and the wife. Then you are going to lower the resistance. A little part of them is going to wonder if you’re a weirdo if you don’t have that. If you’re single, you’re smart. You’re smart because you’re going into an industry that is like 70-80% women. So, smart dude if you’re single. If you’re single, know that you’re probably going to get some ladies with resistance. Maybe you take some pictures with your family, maybe it’s with your sister or your niece and nephew. Whatever to kind of reduce the resistance make you not look so weird. I prospected and recruited a lot of women. And I think maybe twice it got weird where they wanted something. You know what I’m saying? I just kept it professional. Don’t say that man because that just like, resistance just skyrockets. And so, I would never lead with that. So, I would compliment them on their intelligence. I would compliment them on some kind of comment that they made or something like that. I would not say, “You’re pretty.” Don’t say anything like that. And as a guy, I wouldn’t say, “Oh wow, nice shoes.” Cause then it gets a little weird. It’s a good idea to drop compliments and say things, but when it comes to that situation if you’re a dude prospecting a lady I would not compliment looks. If they’re working out in the gym don’t go there. I would just be very aware that they’re thinking you’re all eyeballs. And so, pictures of wifey that’s a great idea. If you don’t have wifey pictures of family, warm pictures that don’t make you look creepers, and don’t compliment their looks. Don’t compliment, “Hey, great form on the exercise bike.” Don’t be creepy. And you may genuinely think, “Well I’m just saying she really is pretty.” I’m telling you they’re taking it the wrong way it’s not working out. OMG! “You’re really pretty” … that was so creepy … Haha! A lot of guys need to watch this … I’m pretty resistant to doing business with men because of these reasons.